If you nodded your head at anything on that list than don't worry you are not alone. 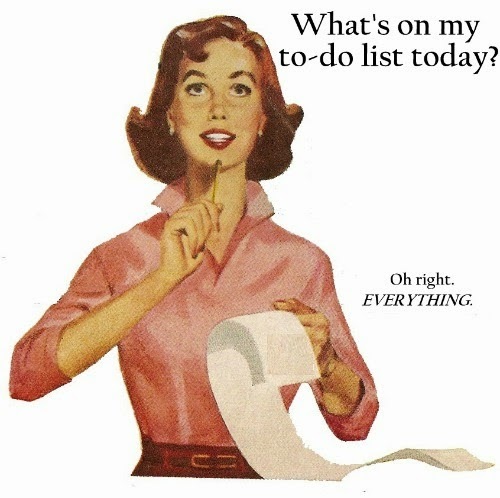 Along with our long daily to do lists, thanks to Pintrest, we now have endless "want to do" to do lists(try saying that one five times fast) of recipes, crafts, kids activities, home décor ideas and so much more running through our heads all day. 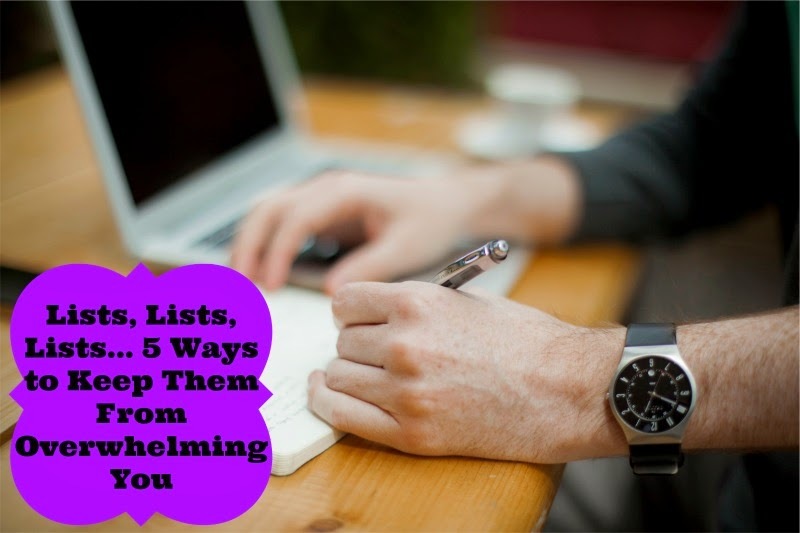 All of these lists, which can never truly be finished, can become very overwhelming and can start to make us feel like we are going a little bit crazy. So since this is something that happens to me on occasion I thought I would share some ways that helps me cool down when my lists start to become a bit too much. 1. Write down your list. No matter how long your list may be, even if it is endless, write down as much of it as you can until you start to feel that weight lifting off of your shoulders. Then do one or two things from that list and put the list away. Take the rest of the day to play with your kids outside or in their rooms and forget the list for now, there is always tomorrow that you can clean the kitchen. 2. Take a second just to breathe. This may sound silly but it helps me a lot if I just find a comfy place to sit and all I think about is my breathing. Take long deep breathes and don't think about anything else. Just clear your mind of anything list related and instead count your breaths or think about something you know will calm you. 3. Delegate. Do you have kids? Do you have things on the list that they can help you with? Let them! I know very well that most kids do not like doing chores but my two year old loves helping me with anything I need help with. This is great because I get a helper and we also get to spend that time together just her and I. You can also ask your husband. I know that as wives we like to let our husbands relax after they get home from work but sometimes it is ok to ask them for help especially when we are having a particularly rough day. You could even have them take the kids and play with them in their room so you can have a few quite minutes to finish some of the items on your list. 4. Set Priorities. Do you have a long daily to do list? Decide at the beginning of the day what is going to be your priority. Is playing one on one with your kids going to be the priority over cleaning the kitchen and starting some laundry? Or are you going to decide to pick up the clutter around the house instead of weeding the garden? No matter what it is, decide before you start anything, which things are more demanding of your attention that day than other things. 5. Be ok with not getting to everything. This is the most important of the five. You will not get to everything no matter how hard you try and because of that you have to be fine with having to go to sleep with a dirty kitchen or a load of laundry still in the dryer just this once. If you stress over it you will be right where you were, overwhelmed and over stressed. It is ok to have some dirty dishes waiting in the sink, or have unwashed clothes sitting on the floor, as long as you tried your best, even if your best didn't feel good enough, you will survive.